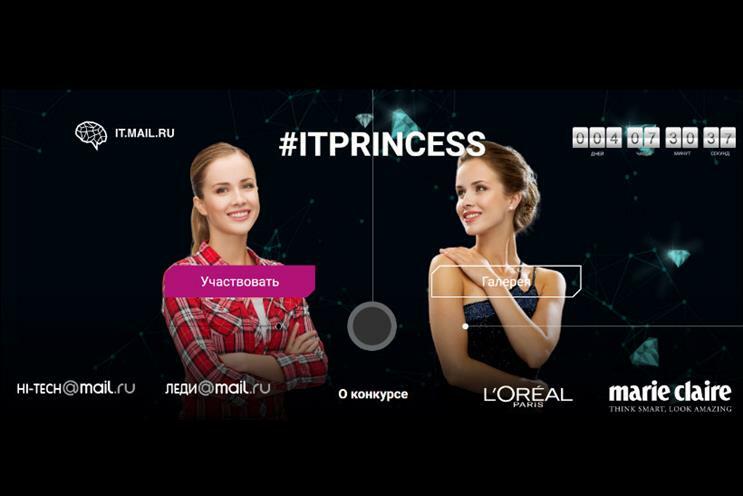 L'Oreal Paris is among the sponsors of 'IT Princess', a controversial beauty competition for women in technology run by one of the country's biggest internet companies, Mail.ru. It asks women in tech, or those who aspire to work in tech, to submit photos of themselves along with a personal statement. Mail.ru’s users will then vote for their ten favourite women between 28 March and 13 April. The competition offers women in technology a chance to work at Mail.ru if they win, along with other prizes such as a 'beauty basket', spa days and hotel stays. A photo gallery shows a that a number of women have entered the competition, apparently including an employee from Microsoft. A shortlist of finalists will be interviewed by a jury between 22 April and 23 April to find the winner. Surprisingly, the jury mostly consists of high-profile women, including Marie Claire's editor in Russia, the head of Mail.ru's 'Lady' offering, and L'Oreal's director general in Russia. There's is one male judge from Mail.ru on the panel. According to a translation of the competition’s entry page, the ten photos which receive the most ‘likes’ will receive an ‘Audience Award’. One female Russian user, responding to the competition on Twitter, joked: "Can I get a project where I can like cute cats? Or it is not right to judge by appearance?" Aside from L'Oreal Paris, the competition is sponsored by Marie Claire. Asked by Marketing for comment, L’Oreal UK distanced itself from the competition. A spokeswoman said: "I can confirm that this is a Russian competition organised and run by Mail.ru Group and L’Oréal Paris in Russia is a partner. "This is not an approach we follow in the UK. In the UK, L’Oréal supports STEM careers through programmes such as L’Oréal UK & Ireland and UNESCO ‘Fellowships For Women In Science’ and the L’Oréal Young Scientist Centre at the Royal Institution." This isn’t the first time a technology giant has launched an ill-advised campaign targeted at women. IBM last year was slammed for its ‘Hack a hairdryer’ campaign, which was criticised by female scientists for being "patronising".